Throughout my creative journey I questioned the impact of dance within my community and had a desire to combine art and dance to create a vibrant and fun artful experience. Formulating a dance language with a unique "alphabet" inspired by Japanese Calligraphy was my start to this project. The incredible influence of Middle Eastern Dance has empowered millions around the world and my desire is to actively play a role in the growth and education of the arts. With a mission to cultivate the value of the arts within communities and harmonize the Contemporary Art world with the Middle Eastern Dance world, I hope to exhibit this project around the U.S. and hopefully take it internationally. This project began in 2012 and is currently on-going. Dancers/Studios - would you like to host a Calligraphic Dancer Workshop in your space? Email me and we can chat! Dancers/Studios - would you like to host a Calligraphic Dancer Workshop in your space? Email me and we can chat! Exhibition at Belly Motions on October 24, 2015. Performance by Alexandra. Panel Discussion on what the project is about, moderated by Luisa Molina, LuMo Designs. 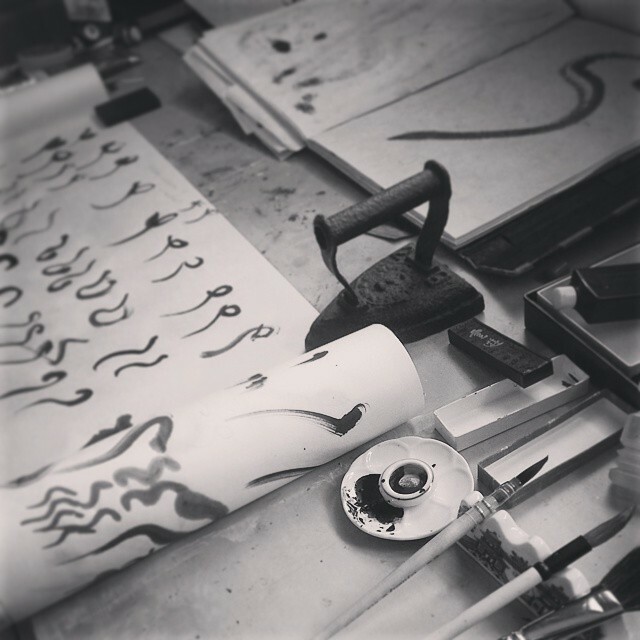 Belly Dancers, would you like to host a Calligraphic Dancer Workshop at your studio?